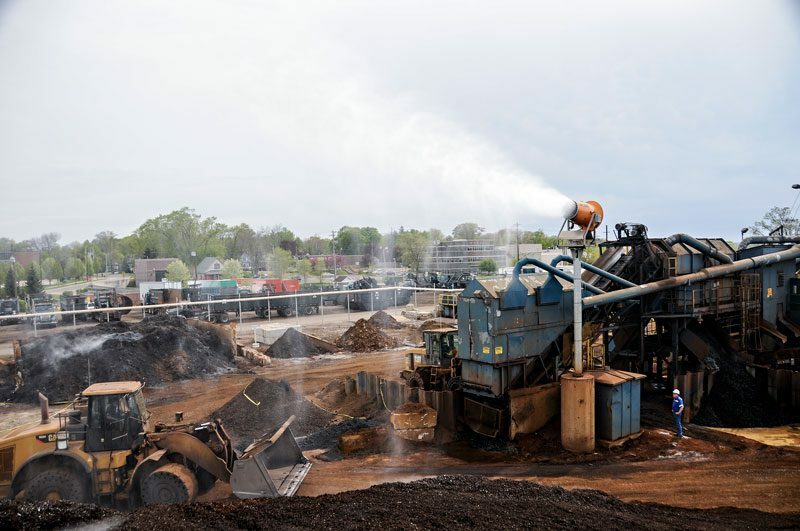 New remote control capabilities have been developed though a collaboration between DustBoss and a pioneering Midwestern US scrapyard,which recently incorporated atomized misting technology for dust suppression at its 29-acre site in downtown Holland, MI. The enhanced control better serves the unique layout and workflow of the facility, making dust control even easier and more efficient for operators moving material. PADNOS has been re-purposing recyclable materials for more than 100 years, serving industrial and commercial accounts throughout the U.S., as well as consumers in and around Michigan. With 21 locations, the company accepts a wide range of materials, including paper, plastics, ferrous and non-ferrous metals, such as iron, steel, stainless, copper, aluminum and brass. "The performance of this design is better than any method we’d tried in the past." Now in its fourth generation of family management, the firm strives to leverage a century of scrap management expertise, implementing industry best practices for optimal efficiency, while maintaining the highest level of environmental stewardship. As part of that philosophy, PADNOS is constantly developing and refining its approach to fugitive material management, with a goal of preventing the escape of any dust or spillage that may be generated by its activities. In late 2012, the company researched equipment to bolster its open-area dust suppression capabilities. The loaders feed a shredder and a large shear. Both have integrated dust suppression, but the outflow dries fairly quickly, especially in hot weather. Subsequent handling of the shredded material inevitably creates dust, which can migrate long distances if left unchecked. Surrounded by businesses and neighborhoods, company officials wanted to take proactive measures to ensure that dust would not create a nuisance for the surrounding community or create a workplace hazard. After investigating several manufacturers and reviewing their equipment choices, PADNOS selected a DustBoss 60 (DB-60) to deliver suppression over three processing centers, covering about three acres in all. The atomized misting unit generates millions of droplets specifically sized to maximize dust suppressio, and then launches them over large distances in an engineered air plume created by a powerful ducted fan. Supplied with a 20-foot (6-meter) mounting tower, the DB-60 was installed atop a 10-foot (3-meter) concrete pedestal to increase its range and aiming ability even further. From the time of its initial arrival, the PADNOS team was pleased with the results of using the DustBoss. “The performance of this design is better than any method we’d tried in the past, and eliminating the manual spraying presented immediate labor savings for us,” Driesenga said. The unit was originally supplied with four optional remote controls, giving loader operators the ability to turn the unit and the oscillation on or off at any time. The oscillation range, however, was only programmable at the panel. Although the system performed well, operators noticed an opportunity to obtain even more benefit from the system. Driesenga explained that loading and unloading could take place at nearly any point within the roughly 3-acre area, and the 359° oscillation was a key to reaching those activities. But the relatively slow oscillation speed prevented a quick rotation of the barrel to focus on an arriving truck. Operators had to wait for the machine to oscillate to the required spot. DustBoss engineers decided that they could achieve the desired repositioning speed by replacing the fixed-speed oscillation motor with one that turned approximately 4x faster, coupled to a variable-frequency drive (VFD). To avoid having to ship the unit back for the revisions, DustBoss personnel completed the gear motor change-out, panel modifications, and VFD installation on-site. Three-acre scrap recycling area that sorts and processes a wide variety of materials for repurposing, including shearing, shredding and bricking of paper, plastics and metals. Find a suppression method to improve on the performance of hoses, sprinklers, water trucks and existing dust control equipment, making dust management easier and more effective, while improving working conditions and air quality readings at the site. Constant air monitoring at the PADNOS site have confirmed the machine’s effectiveness, helping the company to remain in full compliance with air quality regulations. “The performance is better than any method we’d tried in the past, and eliminating the manual spraying presented immediate labor savings for us,” said a company official. handles recyclables for industrial and commercial accounts in the U.S. From California to the far Northeast of Canada, the firm actively manages scrap for clients with accuracy, efficiency and control. The company prides itself on developing efficient, environmentally-responsible processes for all phases of its business, with a culture that fosters collaboration, creative problem-solving and continuous improvement. 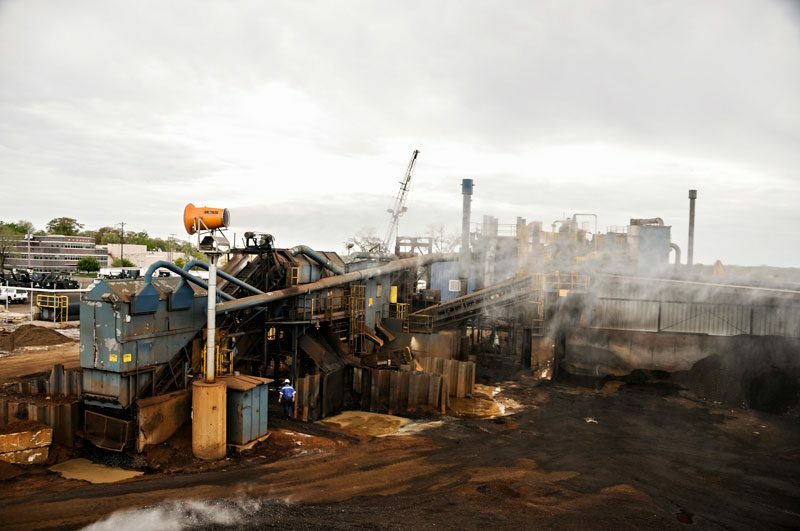 This entry was posted in DB-60, DustBoss, News, Recycling / Scrap, Remote Control / Automation, Shredder, Stockpile, Tower. Bookmark the permalink. Both comments and trackbacks are currently closed.